Watching the movie “Indivisible” made me realize even more how life is like war. 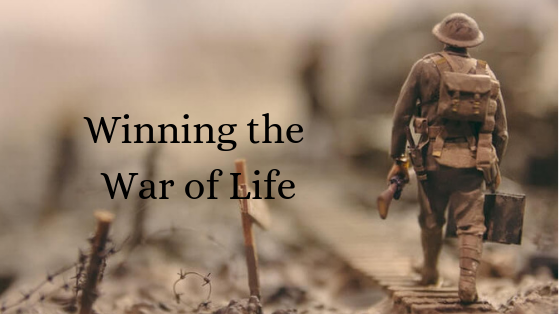 The harsh realities of war can really take a toll on the mind, on family and friends. War is difficult and there is nothing easy about it. Timothy was a young man who responded to Christ’s call to help build His church. Along with Titus, he was one of the apostle Paul’s special assistants in the churches that Paul had founded. Timothy was brought up in a religious home (2 Timothy 1:5) and had been led to faith in Christ by Paul himself. This explains why Paul called Timothy “my true son in the faith” (1 Timothy 1:2). But in spite of his close association with Paul, Timothy was easily discouraged. So Paul wrote the letter we call 1 Timothy to encourage Timothy to stay on at Ephesus, to explain how a local church should be managed and to enforce his own authority as a servant of God. It was not easy to serve God in pagan Ephesus. The city was devoted to the worship of Artemis, the patroness of the sexual instinct. Her lascivious images helped promote sexual immorality of all kinds. Paul had done a great work in Ephesus during his three-year ministry, and so the “all who dwelt in Asia heard the word of the Lord Jesus, both Jews and Greeks” (Acts 19:10). It was not easy for Timothy to follow a man like Paul! Not to forget, Satan has his workers in the city, for wherever there are spiritual opportunities there are also satanic obstacles (1 Corinthians 16:8-9). But Timothy was a man under orders, and he had to obey. 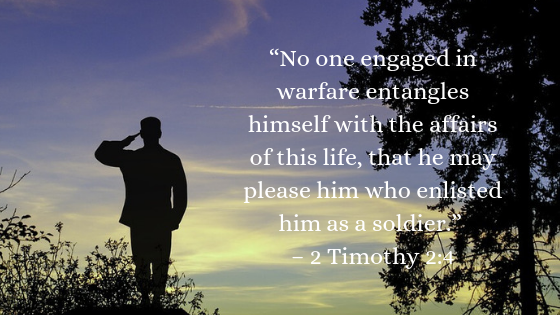 The soldier’s task is to “please the officer who enlisted him as soldier” (2 Timothy 2:4), and not to please himself. Furthermore, Timothy was there by divine appointment: God had chosen him and sent him. It was this fact that could give him assurance in difficult days. As children of God, we are currently in a spiritual warfare. We all live in a war. We all have our own trials and struggles. I remember saying just a few days ago that life is difficult. Between money and bills, relationships and breakups, addiction and peer pressures; they are all difficult. Some might have a depressed attitude or “Woe is me” kind of attitude because they feel alone in their war. That is the wrong way to look at it. Everyone has problems. Each individual might have a different set of problems but we all have them. Even Jesus had trials. Jesus suffered and died. You cannot be more human than that. But Jesus has always responded to those trials with the right attitude and did not sin. Jesus loves you and can relate very well with what you’re going through more than you can imagine. Have you accepted His free gift of forgiveness? Interestingly, I just finished the series on the Christian Armor (which will be published here very soon), but I missed including “why” we need the armor. Let me just say that this armor is not just for spiritual battles but it also affects how we respond to everyday life. Knowing that everyone has their trials and struggles should affect how we respond to others. At the beginning of the movie “Indivisible,” the spiritual leader came alongside those individuals that were hurting and encouraged them because he loved them and cared for them as God loves us. Jesus is the perfect example of love and encouragement. It does not matter what you have done; Jesus will take you back. After becoming a Christian, we are supposed to be like Christ. Are you that encouraging? As the movie continued, God used that spiritual leader to see spiritual fruit in others. You never know how you could affect the spiritual life of another individual. Don’t waste the opportunity to bring someone closer to God. As the movie was ending, I was also reminded that spiritual leaders are not immune either. The spiritual leader in the movie had to be encouraged by those he had encouraged. We are all responsible for those around us. Nobody is too high up that we can’t encourage them. Like Timothy, nobody is immune and so we all need encouragement. Timothy was so devoted to Christ that his local church leaders recommended him to Paul, and Paul added him to his “missionary staff” (Acts 16:1-5). Yet Timothy was easily discouraged and needed encouragement which Paul gave him in this letters. One way to think about the sequence of development that we experience in the Christian life is that we begin as “Timothys,” with the goal of growing toward “Paul-like” maturity. Even Paul started out as a “Timothy,” stunned by God’s interruption of his life on the road to Damascus. He suddenly needed an older, wiser believer to walk him through the first steps in his new life, and God assigned that task to Ananias. Just for the fact that Jesus is also human, you cannot tell me He does not appreciate hearing us say, “Thank you” or praising God for all He has done and is doing. If you are God’s servant, called by the Spirit, obeying His will, then you can “stay with it” and finish the work. Having the assurance like Timothy had that you are here by divine appointment, chosen and sent by God, will enable you to “fight well in the Lord’s battles” and finish the work. How well are you encouraging your team members in this war of life? Indivisible: One Marriage Under God is a devotional that offers hope and encouragement to anyone in a challenging season of marriage. Based on the movie Indivisible – the true story of an Army chaplain and his wife who rebuild their marriage – this devotional offers 50 entries that include an inspirational message, a Scripture passage, a prayer, guided journaling, and a “Take Action” challenge. An ideal gift for military couples, newlyweds, and those who want to strengthen their commitment.